The Museum has several sheep markers in different sizes. Some are for marking the sheep's newly shorn fleece with a hot tar or dye, so she is identifiable from any distance away. The "smit mark" only lasts until she is shorn again, but is easy to read. Failing to mark a sheep after clipping may mean she can't be identified if she strays: thus, "losing the sheep for a ha'porth of tar". The letter many stand for the owner's surname, or the farm name, such as Aldby. An alternative interpretation of the "ha'porth of tar" may be a reference to the "salving" of sheep. Some of the markers are for branding the ewe's horns. The horn burn is smaller than the fleece mark, but permanent. The ewe will carry her horns and the horn burn all her life, unless she is poorly fed at some time. Then she may grow a weak section of horn and lose the horn by an accident. 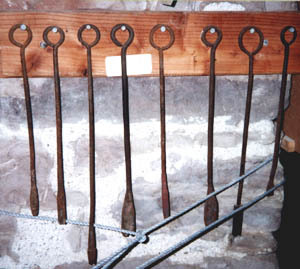 Right: An assortment of horn brands. 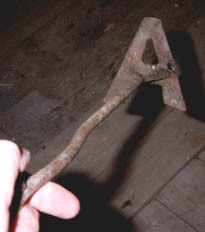 Each farm had a set with its own letters; several were needed, so that some were heating while others were in use. Farms with common grazing on the fell used this system combined with "lug marks" - specific shapes snipped out of the ear - and smit marks. Today all sheep have to carry ear-tags which identify which farm they came from, and the tags are individually numbered for each animal.